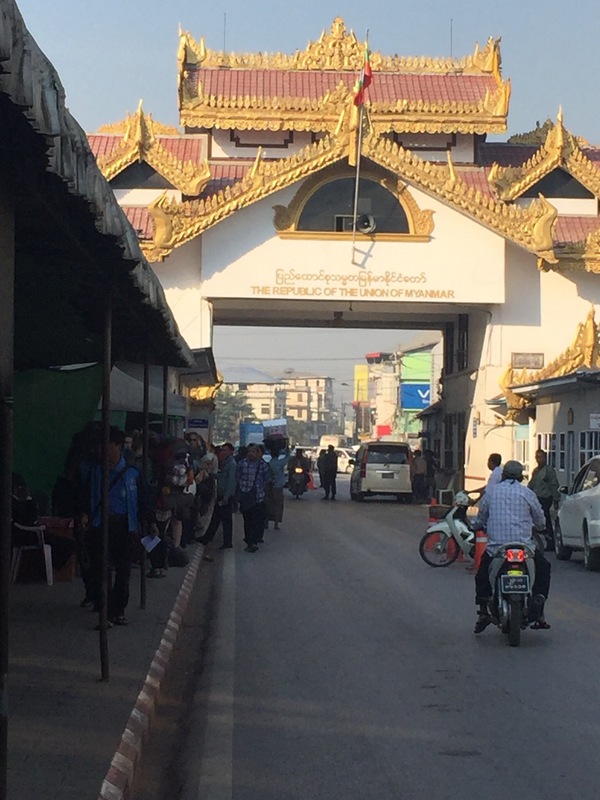 I walked across the Friensdship Bridge to Myanmar for a day with a temporary visa. 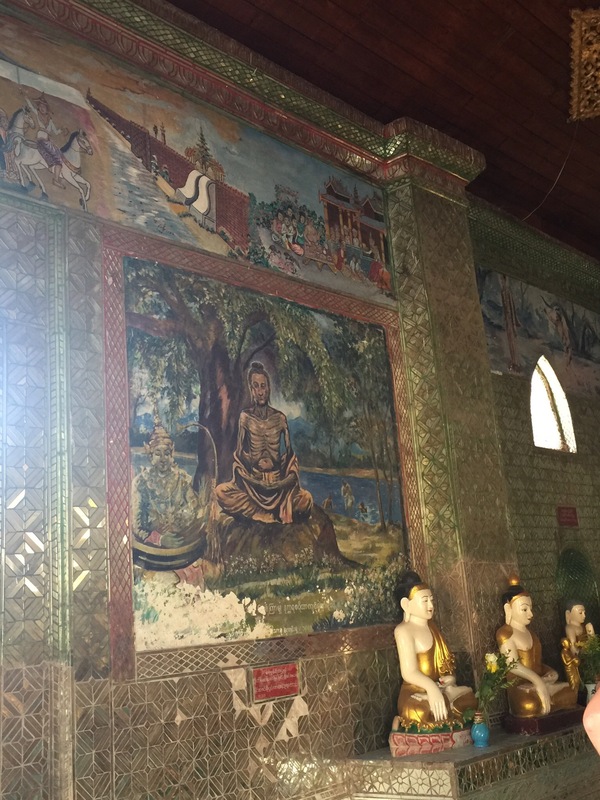 It was noticeably poorer than Thailand but I saw some beautiful temples and wall murals. They were a different style than what I have seen so far. The food was different as well – not as sweet and sour and more chick peas. Also delicious – just different. I would have liked to spend more time there but a day was the most I could get with the temporary visa. You can see why the food is so spicy. My next destination was Umphang, the end of the road into the mountains. It was a long, circuitous route to get there; Ayutthaya to Sukhothai to Mae Sot, and then a songthaew to the small mountain village. A songthaew is a pick-up truck with a metal roof, metal seats built into the sides of the bed, and no tailgate – just a metal step up with an extended seat. People and crates of food are snugged in close together, both inside and on the roof. I got on the bus in the early evening from Aytthaya, intending to layover in Sukhothai, but when I arrived there at 2 am it seemed easier to just take the 4 am bus to Mae Sot. I arrived in Mae Sot at 8 am. I hadn’t slept and I don’t know what possessed me to carry on. I guess I was eager and I took the next songthaew for Umphang. 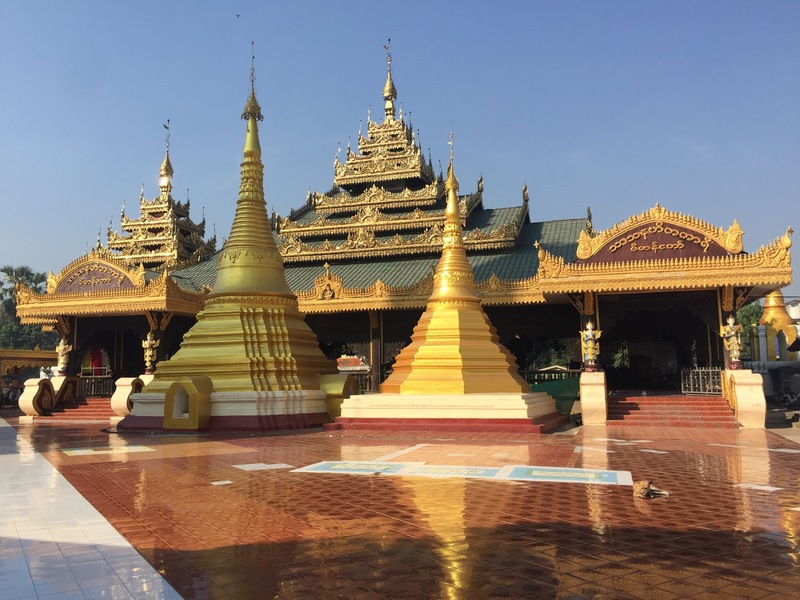 l was looking forward to seeing the spectacular scenery, as well as a camp housing 10,000 Burmese refuges en route. It was a six-hour plus trip but I would sleep when I arrived, and then continue on the next day to the trailhead of a renowned waterfall where I wanted to camp for a few more days and hike. It was a good plan! It started to go sideways about an hour in. I was on the back seat, with a wide open view for picture taking, but I was white-knuckling the metal pole and chose life over photo ops. I began to feel nauseous and closed my eyes. When we finally arrived, after hours of lurching around hairpin turn after hairpin turn, I was beyond grateful. Except we hadn’t arrived. 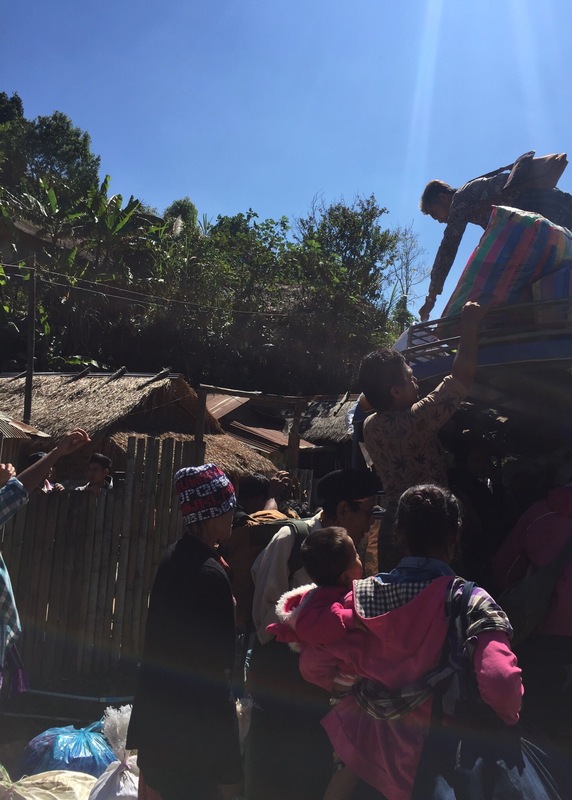 We were picking up more people and supplies from a Karen tribe mountain village. When all 23 of us were loaded (many with painted faces), I was sandwiched in the centre of the seat, balancing two pre-toddlers on my lap. We started again – and then it got rough. Eyes still closed, it took all of my willpower not to throw up. There was simply no way I could allow that to happen. And then that awful moment came when you know it’s coming – and there is nothing you can do about it. As unobtrusively as possible, I turned my head out the side and started to heave. I was aware that one of the babies was lifted from my lap; I cradled the others’ sleeping head in my hand so it didn’t bump against the metal side as my stomach emptied into the wind. With my free arm I tried, in vain, to shield the man beside me, and the orange robe of the monk beside him, as the vomit was whipped back onto my t-shirt and down my arm. The truck continued back and forth, pitching from side to side. I heard a young girl whisper to me in broken English, “only 2 hour more”. I nodded my head in thanks, my body still twisted, face hanging out the window, eyes closed. I accepted the misery and went to a place deep inside, where I was aware of nothing except the wind on my face, and my arm wrapped around the baby, his small head cupped in my hand. I stayed there, far away, until we arrived in Umphang. Stained with dried, foul puke, I crawled off the truck, into a guesthouse shower, and then to bed, where I slept a dreamless sleep. The journey may have been hair raising; it may have been stunning, but I saw none of it. The camping and waterfalls were out of the question. 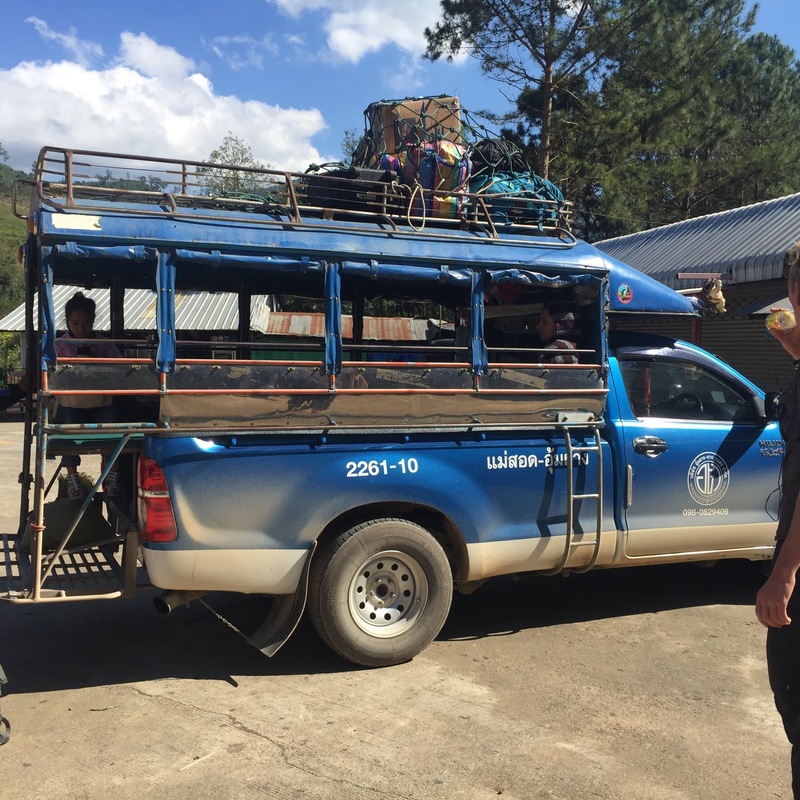 I found out that it was another 50 km songthaew ride through the mountains to the trailhead. I opted to stay at the lovely Umphang guesthouse and go hiking from where I was. There were a two Thai tourists heading to the falls but otherwise, I was alone. And guess what? 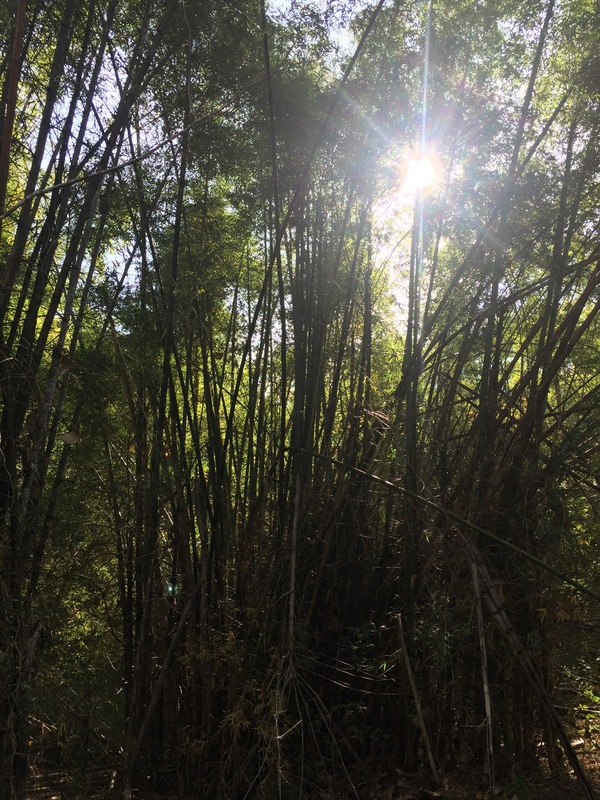 – on a deserted mountain trail, I found a large bamboo forest and heard the groaning and clicking of the bamboo soundscape that I had read about, but didn’t get to hear, in Japan. It was beautiful. 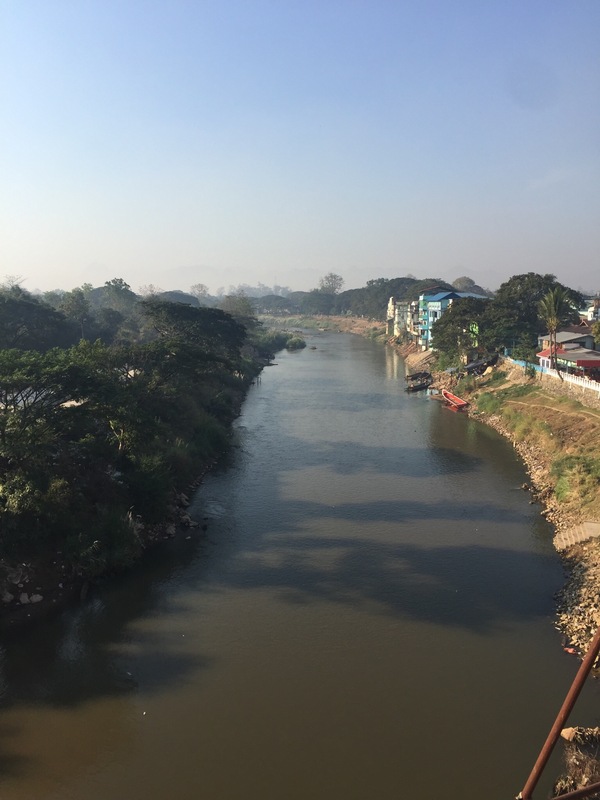 Appendix – Two days later on the ride back to Mae Sot, I was well-rested and well-hydrated. 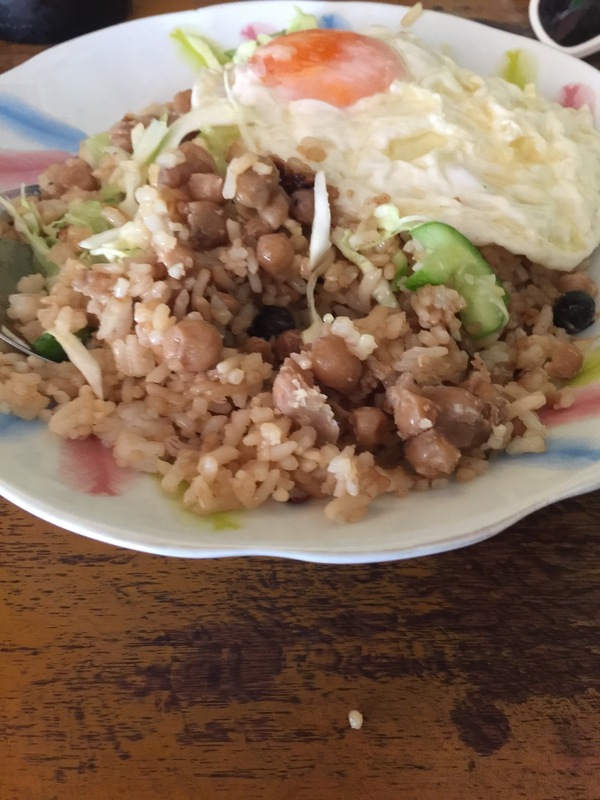 I had only managed to eat some plain rice, and fruit, but I was feeling able. The drive was less jerky; I saw a bit of scenery, and the refugee camp, but for the most part, I played it safe and kept my eyes closed. 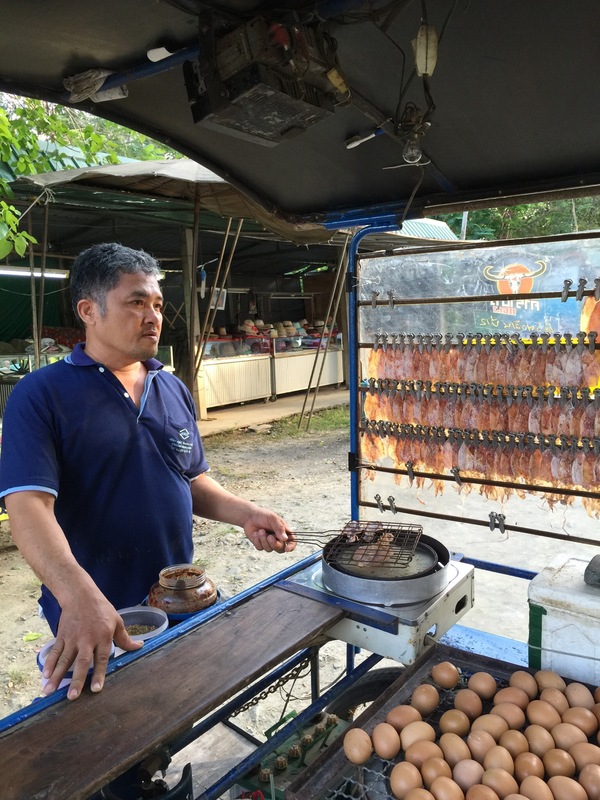 My first foray into roadside food, shortly after I arrived, was at a stand selling fish and rice. 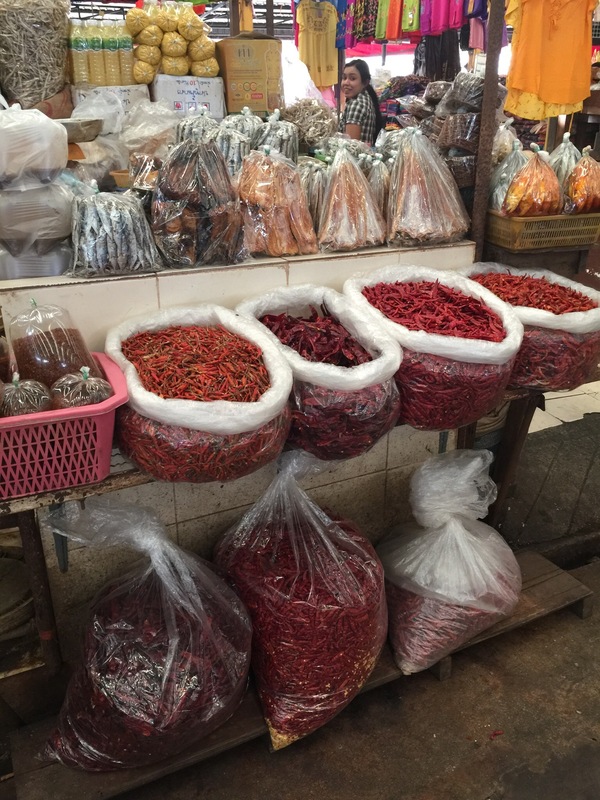 The Thai’s shook their head when I pointed to it, “very, very spicy”, they said. I like spicy, I replied cavalierly. 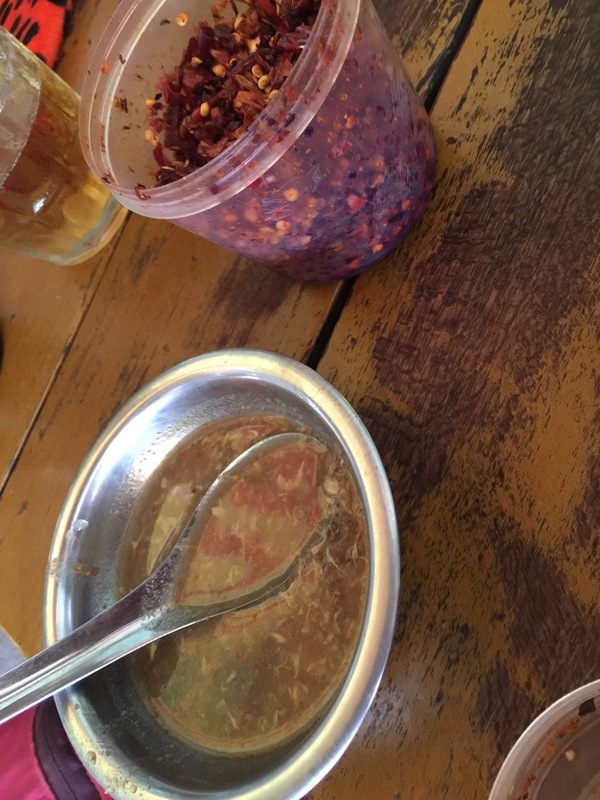 I have learned that when a Thai tells you a food is spicy, you should listen and take heed. I bit into the fish and my eyes immediately teared up and my nose started to run. They were watching me with interest. I smiled, nodded my head in approval, and kept eating. I didn’t know food could get that hot and not burn your mouth off. My whole face felt like it was on fire and then it went numb. My stomach churned and a horrifying image of what this food would feel like coming out, if my body rejected it, flashed through my mind. I have been blessed with a stomach of iron and sometimes that makes me cocky, but imagining the worst case scenario was enough to make me abandon my pride, my fish dish, and definitely my cockiness. I hurried back to my bunk, stopping only to buy (and drink) 3 litres of water to dilute and pacify my unseasoned belly. Fortunately, the food exited my body remarkably well. But I was well aware I had eaten some serious spice… I was well aware. I have since enjoyed experimenting with all manner of local delicacies, but with prudence. The night markets have everything you could possibly imagine. 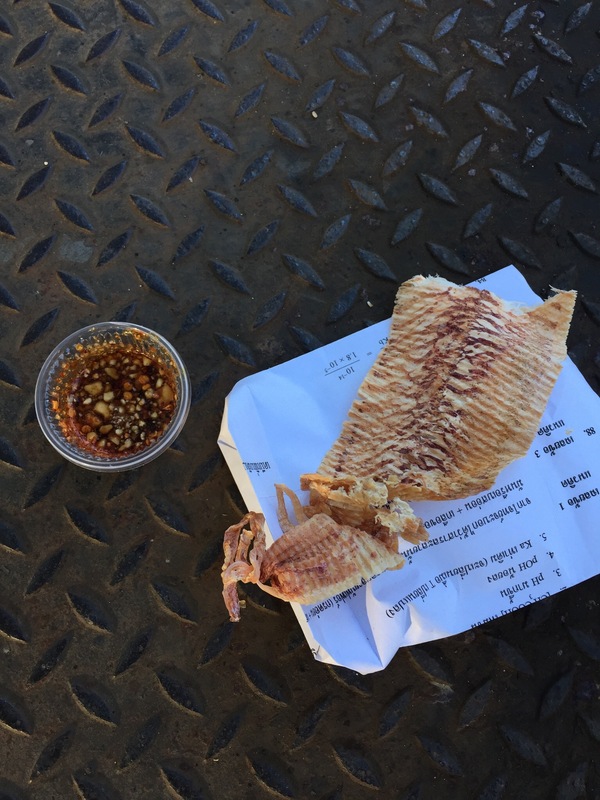 I love the dried, roasted, flattened calamari that is dipped in a spicy, sweet peanut sauce. The food in Thailand is legendary and does not disappoint. It is generally awesome and super cheap. 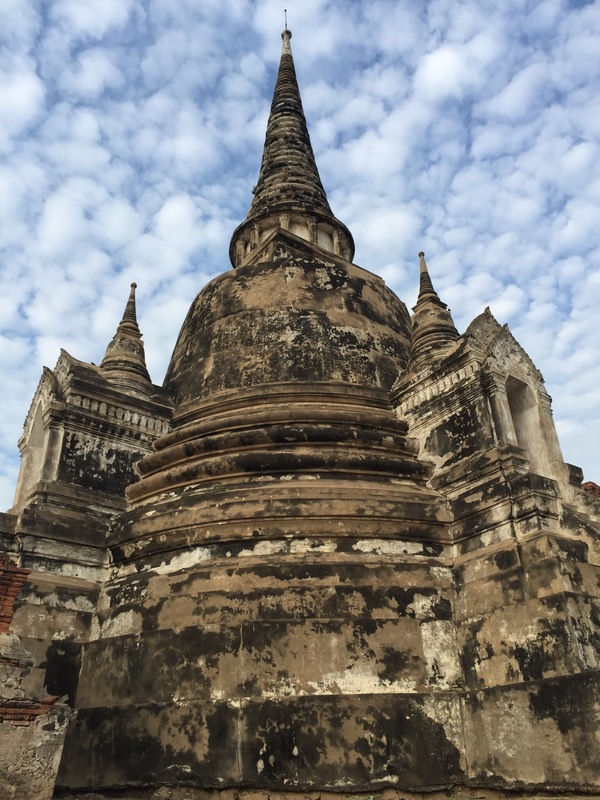 From Kanchanaburi, I took the bus to the fabled, fallen kingdom of Ayutthaya, which is to Thailand what Rome is to Italy, but not as old. Founded in 1351, the heart of the city is on a 4km-wide River island and ruins are scattered everywhere. 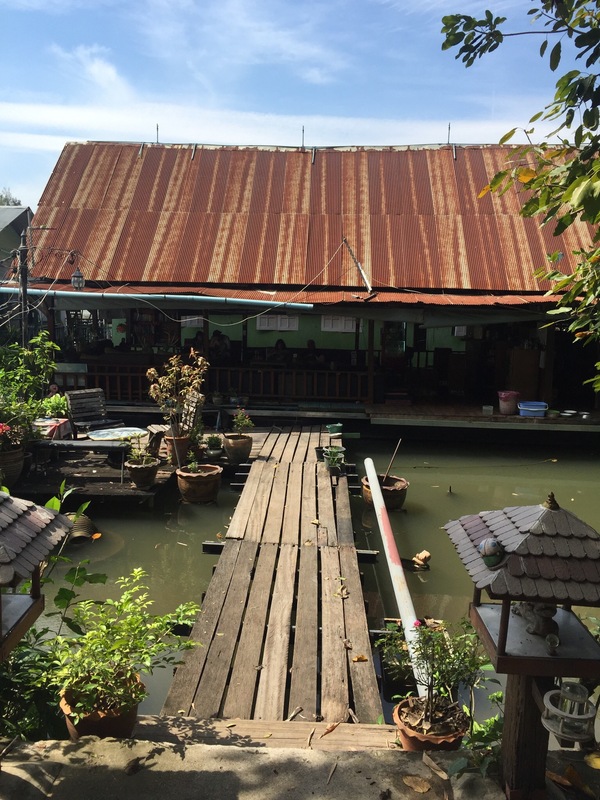 By 1685, in the days when Thailand was called Siam, Ayatthuya had a population of over a million people, roughly double the size of London at the time, living mainly on houseboats. The city was sacked by the Burmese in 1737. 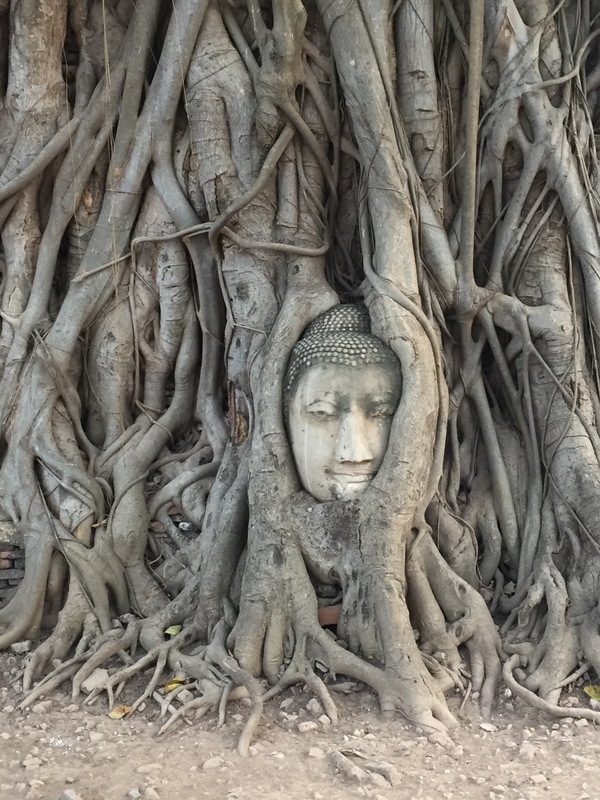 I rented a bicycle for the day (for approx $2) and peddled to the multitude of temples, ruins, and Buddha’s in every form; gold, headless, reclining, even in a tree. 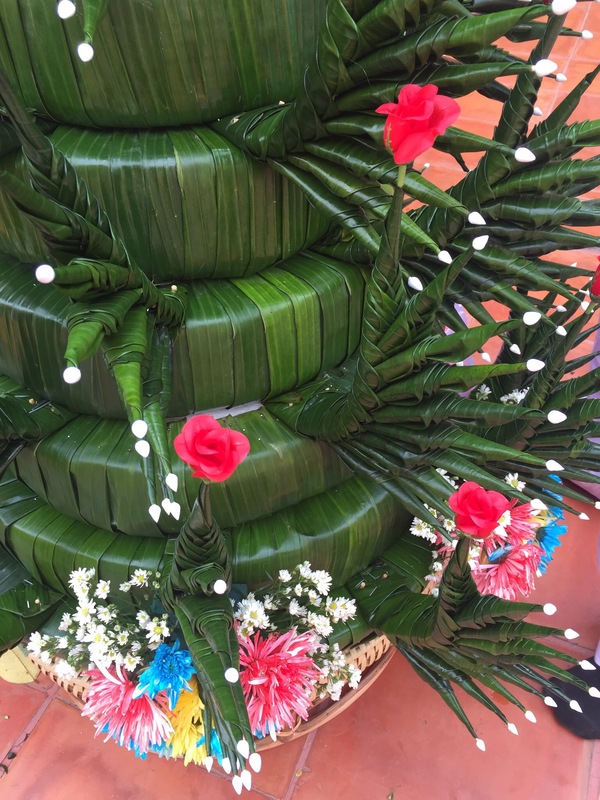 People pay homage and worship the iconic Buddha leaving everything from food, drink, fancy clothes, flowers and small bejewelled statues as offerings. 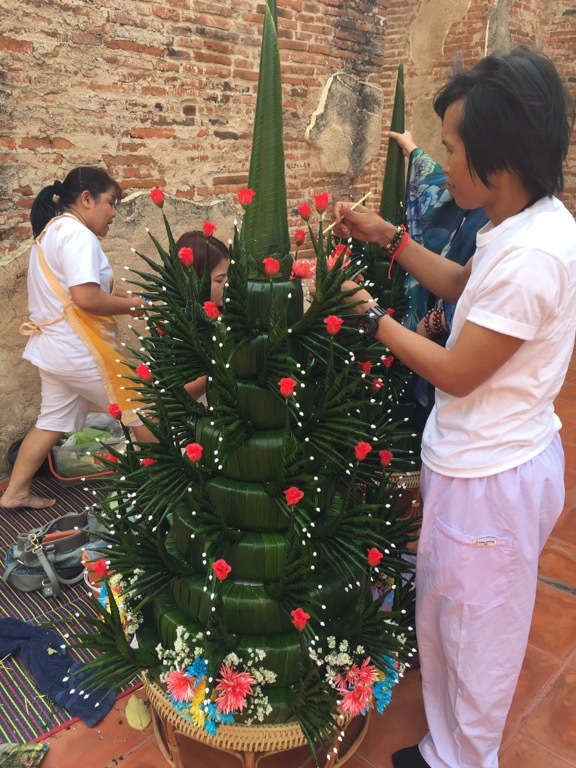 In one royal temple ruin, some Thai people were making two intricate, completely live plant offerings that were incredible works of art. They were on the second day of what would take them three days to construct. On my trusty bike (which turned out to be not so trusty, as I got a flat tire and had to walk back at the end of the day). 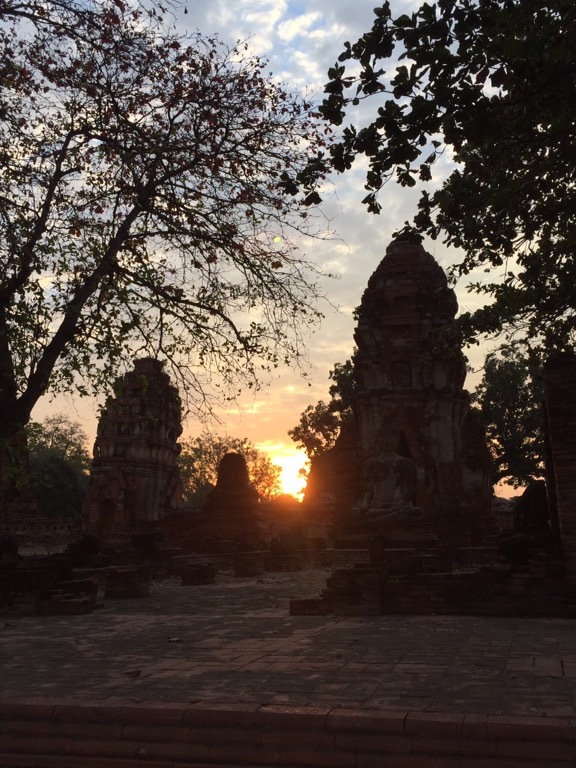 I rode far away from any tourists; I came upon a peaceful arbored garden beside a small temple where white-clad Thai’s were fillings plates of food for themselves from several large pots. When they saw me, they motioned me in and gave me a plate. I sat eating quietly with them, drinking in the purity of the experience. I want to learn more about this gentle culture and thier Buddhist practices. 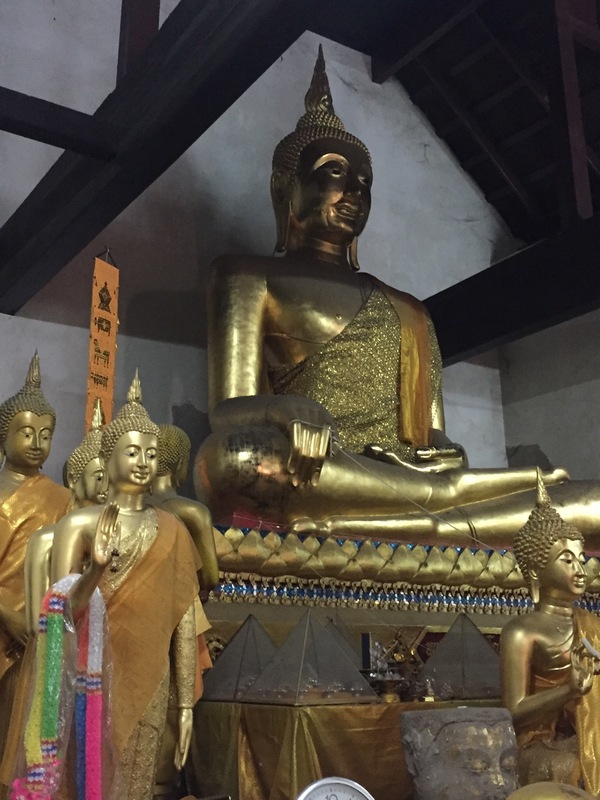 I think when I get to Chang Mai, I’m going to do a meditation retreat. 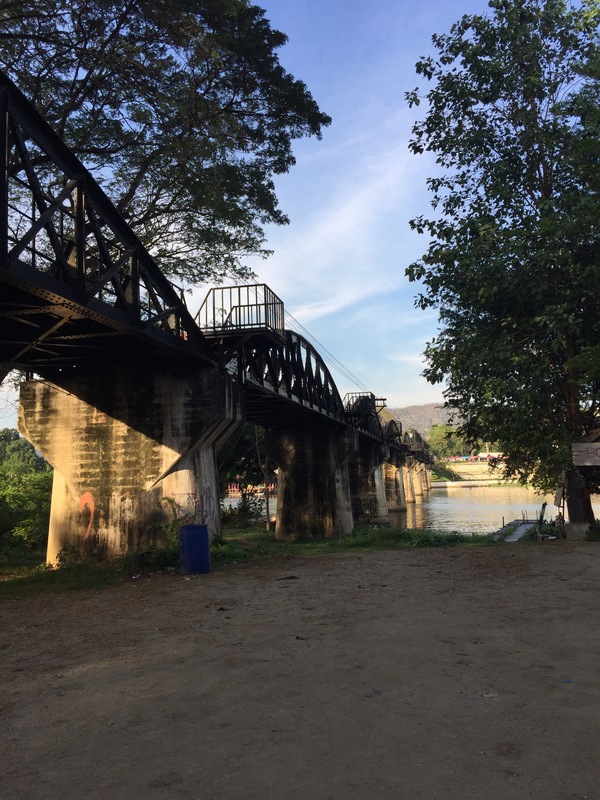 When I was feeling better, I walked across the Bridge over the River Kwai, which is part of “The Death Railway”. 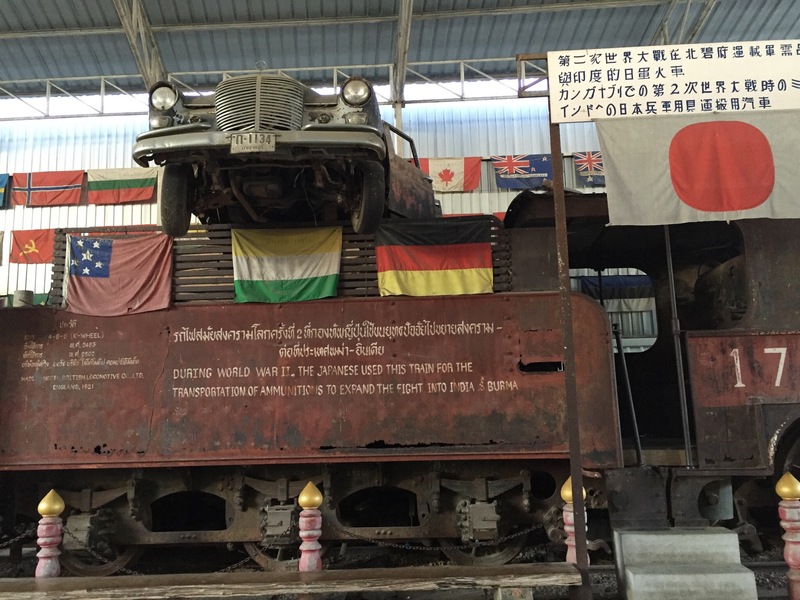 The strategic 415 km railway between Thailand and Burma was built by 230,000, Japanese enslaved, labourers and POW’s in 16 months (the original estimate according to Japanese surveyors was 5 years). Pushed beyond rational limits, 116,000 men died from starvation and disease. Thousands of headstones in Kanchanaburi’s POW cemetery read, “An allied soldier who died during the 1939-1945 war. Known unto God”. 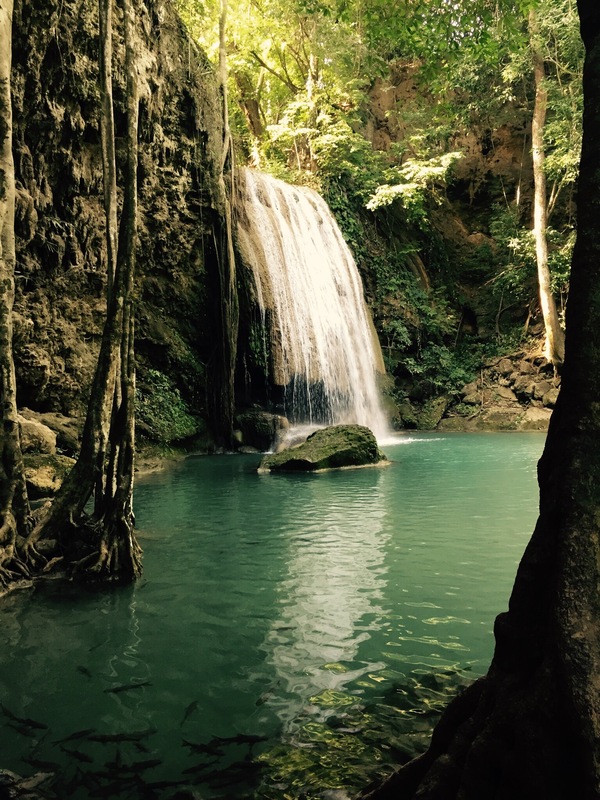 The next day, I took a 2-hour bus ride on “the little bus that could” to Erawan Falls. It is seven-tiers of waterfalls gushing through lush forest, and a challenging trail to the top. On the trek up, I met a delightful, young Dutch girl named Hanna and we had a glorious time, also accumulated a few other hikers en route. People swam in the fish-filled pools of clear, glacial-blue water at the bottom of each falls. They said it tickled when the fish nibbled at their feet. Fish biting my toes when swimming in a lake has long been an irrational fear of mine, so to literally see hoards of fish doing exactly that, sent my heart racing. Finally, determined to face my fear, I psyched myself up and dipped my feet in the clear water. 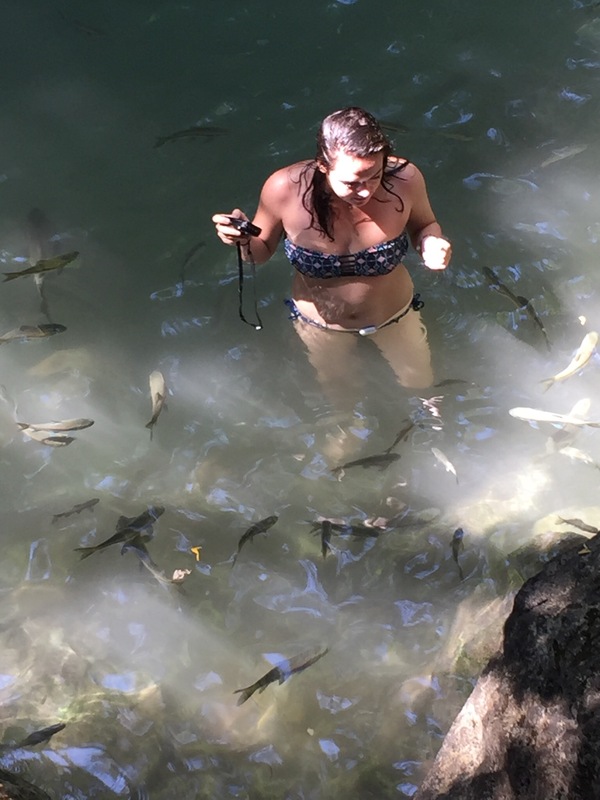 Immediately, fish swarmed to me and snacked on my toes. With a shriek, I withdrew. So much for overcoming my fear. At the next tier there was a rock slide and people were having a blast. 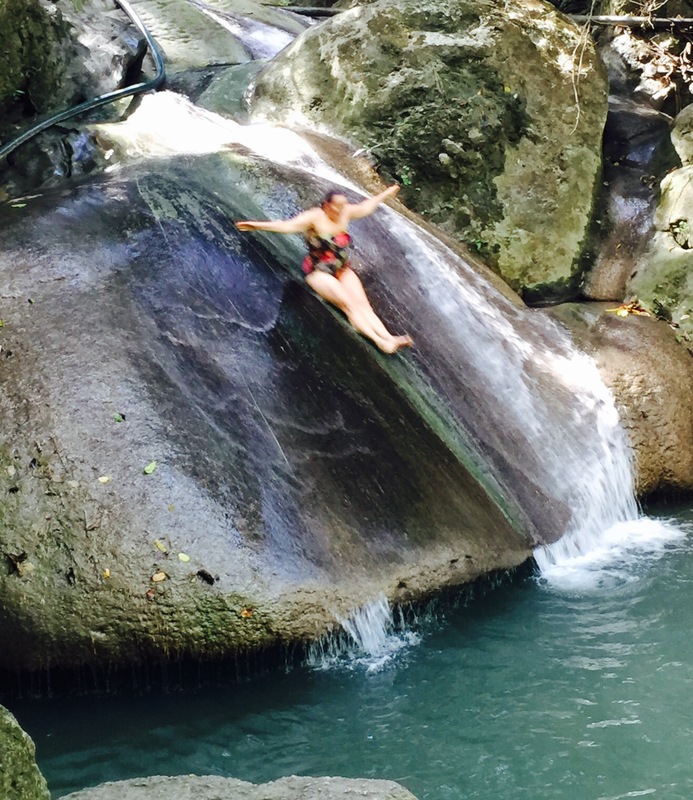 Again, missing all the fun, I decided to dive far and shallow (over the fish), swim like a bat out of hell to the rock, slide down once, and swim back. So that’s what I did. I didn’t overcome my cowardice, but it felt great to give it a punch in the teeth. By the time I arrive in Bangkok and go through customs, I am well and truly sick. Not diarrhea travel sick; sore throat, hacking cough, aches and congestion sick. While I am super happy to have experienced Japan, the noise, the crush of people, the cities, and the lack of sleep, has finally claimed its due. I find a quiet spot under an escalator on the basement floor of the Bangkok airport and lay down until morning. New plan – get out of the city asap! Laying there, reading my rough travellers guide, I like the sound of the Nita Rafthouse. 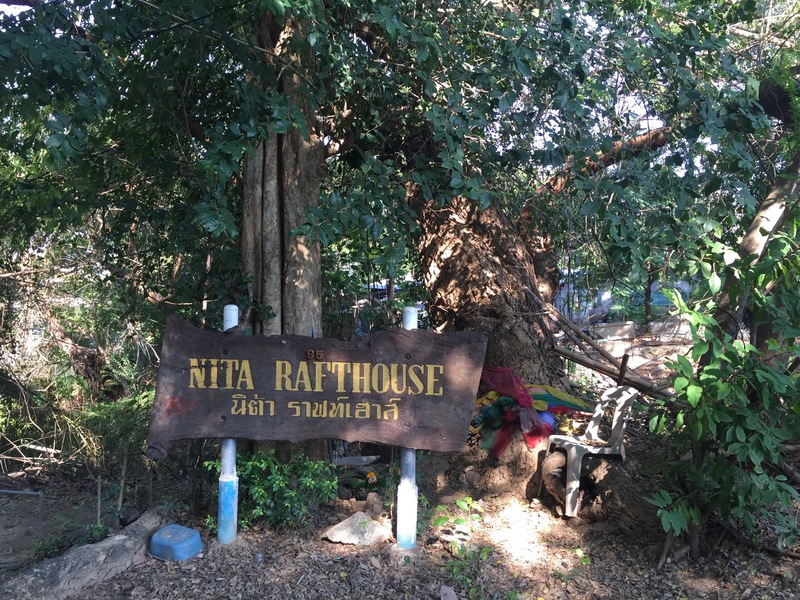 It’s on the River Kwai and well off the beaten track. 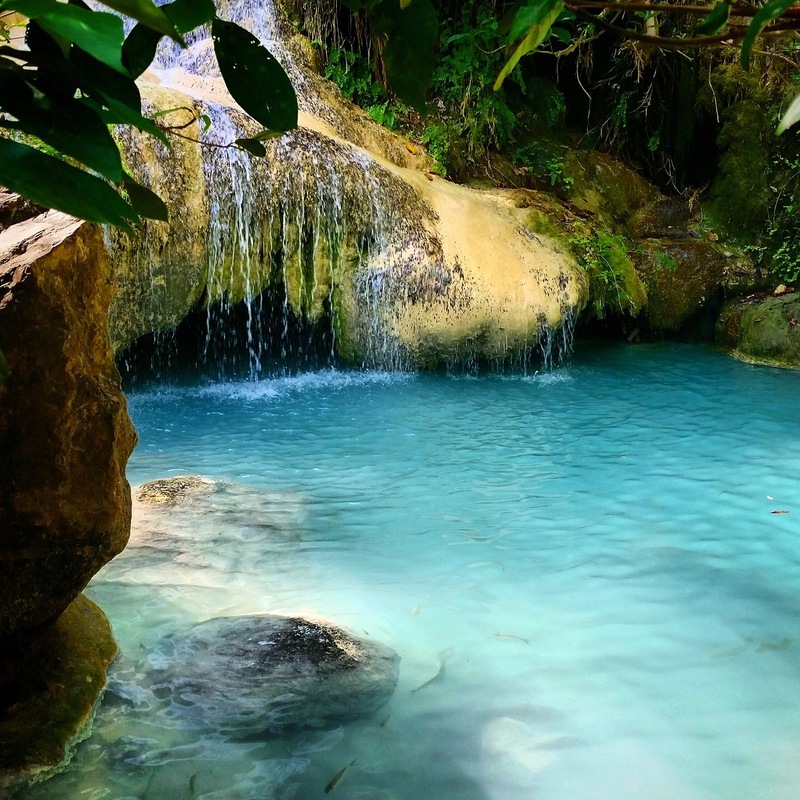 So I set my sights across Thailand’s central plains to the riverside town of Kanchanaburi, 121 kilometres northwest of Bangkok and home to the notorious 1957 movie, “The Bridge on the River Kwai”. Getting there is another matter. To keep me going, I negotiate with myself that this will be the last of enduring city transport for a long while, I take the city train when it opens at 6 am to the subway and the subway to the main train terminal, where I find out that the only train of the day to Kanchanaburi leaves from a small outlying terminal in half an hour. There isn’t time to make it, I am told. I rush outside, quickly haggle a fare with a taxi driver, impress upon him the need for speed, and off we go. When we hit rush hour traffic, I want to say, “there’s an extra 20 in it for you if you get me there on time” just for the fun of actually saying that. But I don’t; he won’t understand and even if he does, there is nothing he can do about the grid lock. 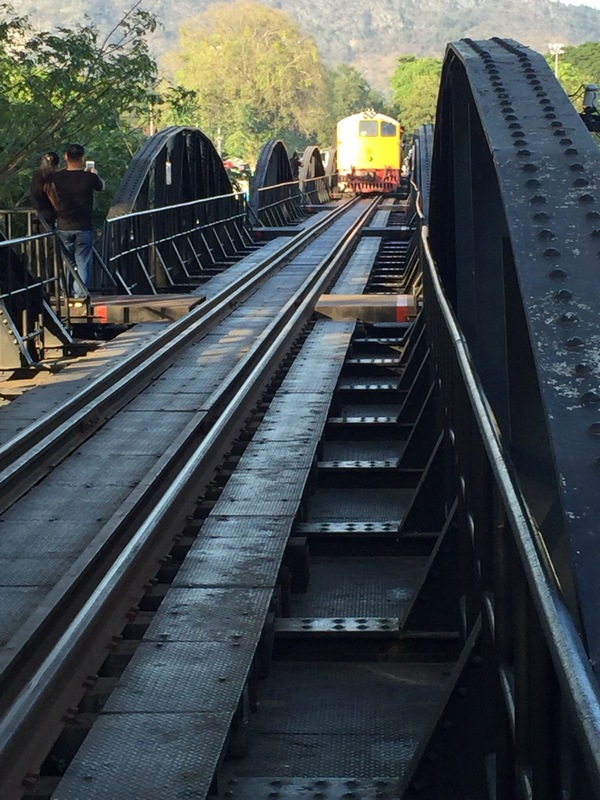 The Kanchanaburi train departure time comes and goes, and still, we sit in traffic. I feel deflated and start thinking about a plan B. Then the driver indicates that the terminal is just down the road and I can run. Maybe the train is running late I think, (it isn’t Japan after all). He lets me out and I run like a mentally-challenged, three-legged cheetah, coughing and rasping all the way. In my mind, Nita Rafthouse has become my lifeline. I finally reach the ticket counter, and miraculously, the train is still there, right in front of me, blowing it’s whistle to go. I quickly buy a ticket, race down the platform as the train starts to move at a snails pace, I cross the tracks and step up onto the slowly departing train. When I collapse on the cracked, vinyl seat, sucking glorious hot, muggy air into my burning lungs, I can’t believe my luck. Everything is working out just fine. Then my seat breaks! It cracks me up. 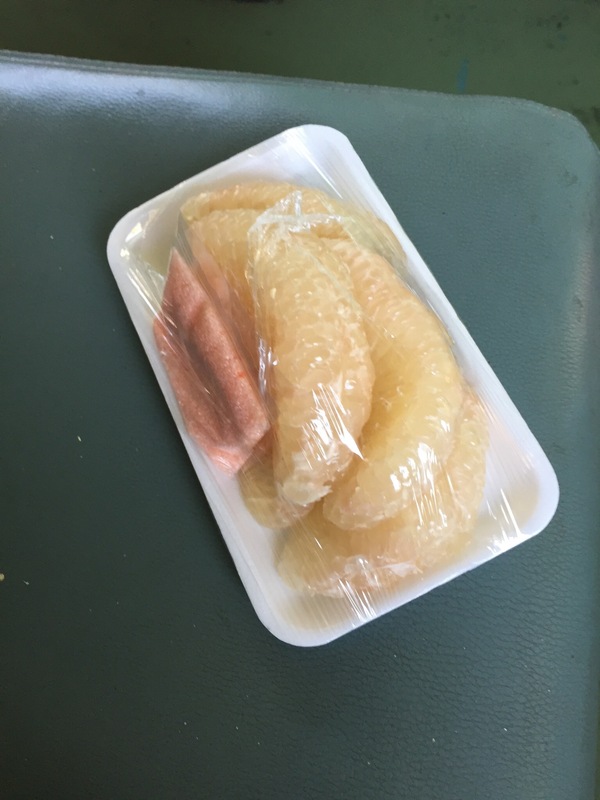 I buy a package of grapefruit on the bus from a lady with a basket selling food. It is sweet and I savour every juicy cell of it. Five hours later I get off the train in Kanchanaburi and start walking down the dusty road. A boy on a scooter stops and offers me a lift for 40 baht (about $1.50). I hop on and ten minutes after that, I am at Nita Rafthouse. By hook or by crook, I have arrived. I walk down to the Rafthouse. The lobby slash restaurant slash office is in the open air wth comfortable couches and low tables. The roof is covered by bamboo and tin. The shower and toilet are separate and basic but adequately service the few people here. The man who works here gives me a book and tells me to write down whatever I take out of the cooler to drink, and what I want to eat, and it will be made for me. It is my book for the duration of my stay and it will be totalled up when I leave. He puts it on the desk. The menu has everything on it – I write down Pad Thai for 50 baht (about $2). It makes the Pad Thai I have eaten at home taste like cardboard. 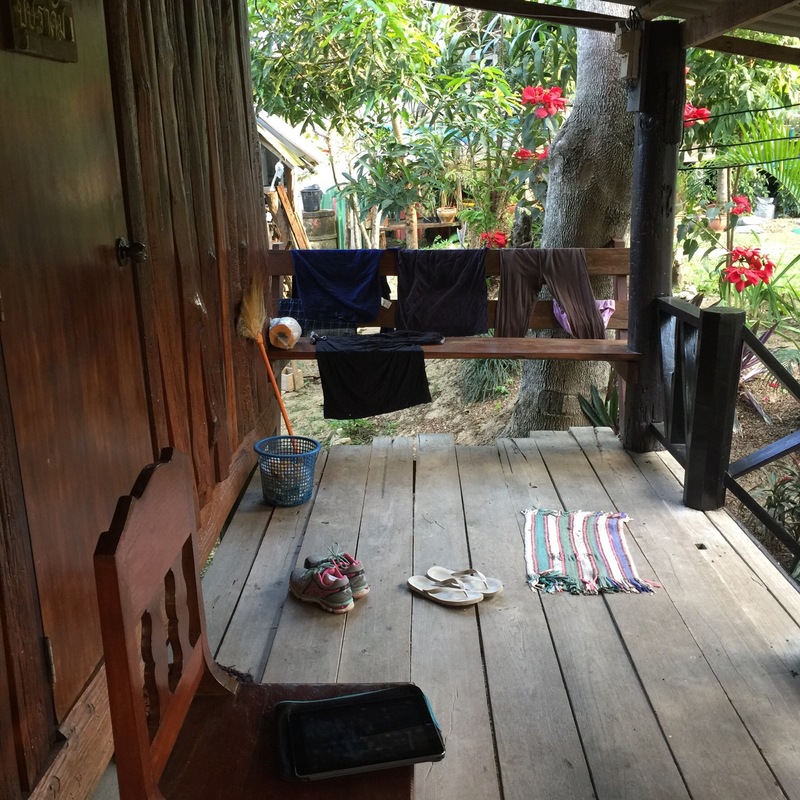 My small, simple, bamboo-woven room costs 150 baht per night (about $6) and is a paradise to me. I look out on the river through my screened window. I hear all manner of birds and insects cawing and chirping, and the occasional splash of a fish. Somewhere, very soft flute music is playing. A fan circulates the warm, humid air. I lay on the mat covering the low wooden platform that is my bed, lulled by the raft’s gentle, almost imperceptible, sway. I decide I’m going to stay awhile. In no time at all, I am fast asleep in my bamboo womb, and for the first time in my entire life, I sleep for 12 hours. 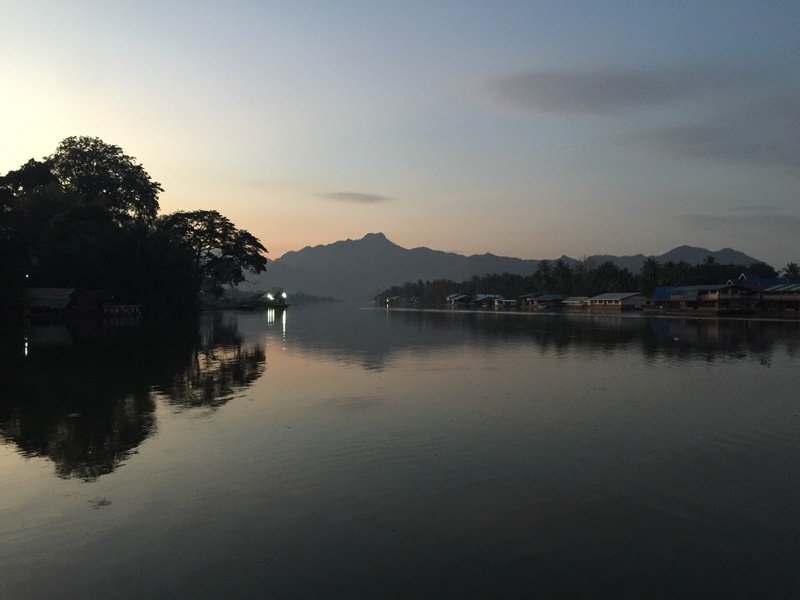 Before light, I get up and go outside to watch the sunrise on the River Kwai, and I start to write. 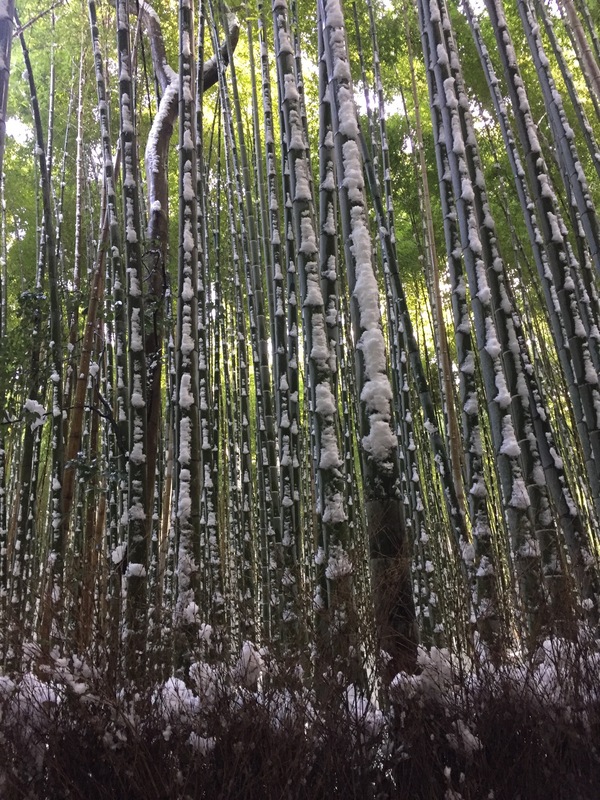 The Sagano Bamboo Forest in Arishyama is reputed to be one of the most beautiful groves on earth. The rustling of tall green stalks swaying in the breeze creates a unique clicking sound that is listed as one of the “hundred soundscapes of Japan”. Entering the famed forest I was completely mesmerized. The towering stalks were like nothing I had seen before. I heard no soundscape through the mostly snow covered trees, but it was still magical. However, my romantic vision of hiking in solitude was a pipe dream. A picture of the bamboo forest is on the cover of Lonely Planets Japan book – it’s not a secret grove. 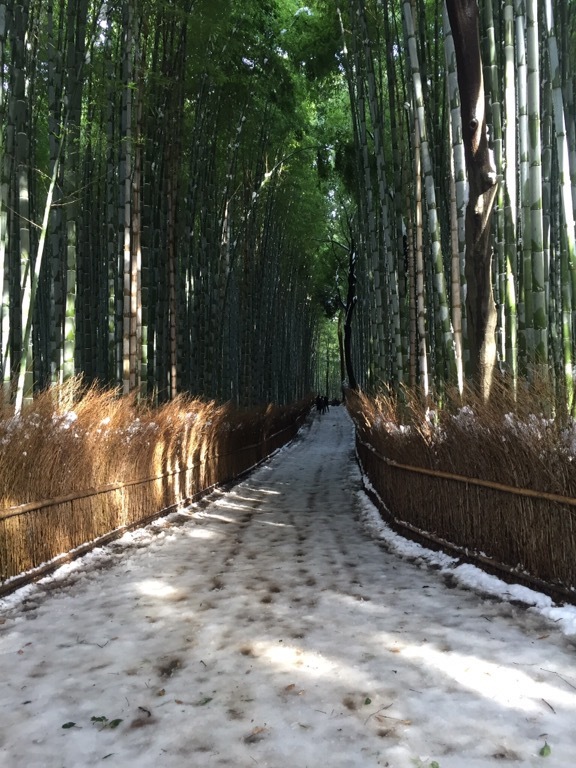 But at one point, I rounded a corner and found the slushy path virtually empty, and for a brief moment, I was alone in the enchanted bamboo wood. Three winks later, two giggling kimono-clad girls rounded the corner, taking selfies, and the moment was lost. I left still wanting to stay – but I was just too cold. The next day I had a Japanese bath. Not knowing the protocol, I followed the woman ahead of me in through the curtained door where tatami mats covered the floor. I stripped buck-naked like she did, and followed her into the main room where multiple hot tubs, cold tub, warm tub and sauna were scattered among statues and trees. Rows of hot and cold taps were close to the floor where old women with beautiful wizened old bodies, adolescents with nubile bodies and everyone in between sat on buckets soaping and scrubbing themselves, and rinsing by pouring multiple pails of water over their heads. Some stations also had large mirrors where people were grooming eyebrows. There are very few overweight people in Japan. And the women are stunning! I was by far the heaviest woman in the bath and the only non-Japanese person there but I decided not to be self-conscious and to simply live it. It was authentic, natural and primal and I loved it. I met a sweet young woman named Ayako who was a teacher and one of the rare people who spoke fluent English. I wanted to take some pictures but wasn’t allowed – obviously. I arrived In Tokyo this morning and fly to Bangkok shortly. 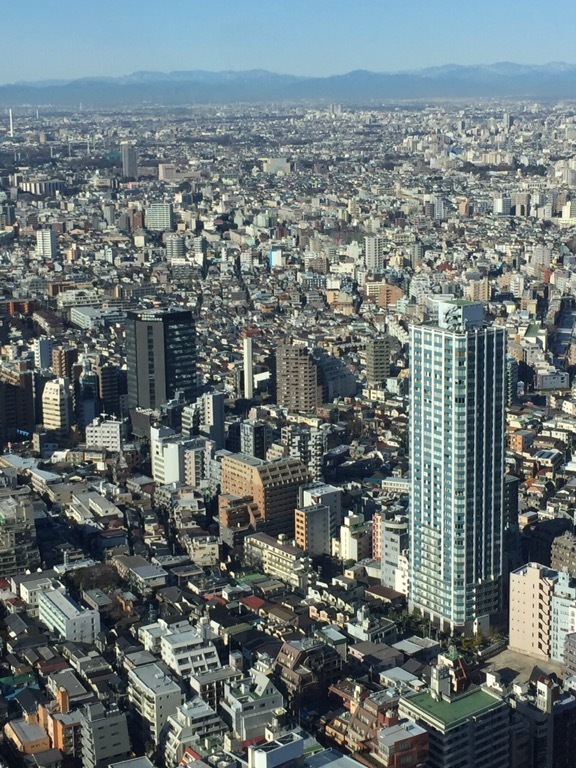 I saw the city in the way that I like to see cities – in one fell swoop from an observation tower. I walked across Shibuya crossing, the busiest crosswalk in the world, navigated my way through the Shinjuku Station, the busiest station in the world (1.5 million people a day pass through it) and gratefully, caught my bus to the airport. Sitting beside me on the bus was a Philippine born Japanese resident who told me to drink hot water for my cough (I’ve developed a bit of a cough) and that the food is very spicy in Bangkok. I told her that I like spicy food. She said she had haemorrhoids, so spicy food was her enemy. We had a lively conversation for the duration of the trip where she continued to share freely. I had a happy surprise when I checked my bank statements – the printout of the ATM exchange (when I arrived in Japan) said I would be charged $ 650.00 Canadian for 30,000 yen when, if I am reading correctly, it actually cost me $350.00, which makes a lot more sense. Japan is expensive but it’s possible to expirience on the cheap. Packaged meals are everywhere, ranging in price from 100 yen for a very small tray of sticky rice, increasing in cost and size for elaborate meals. I’ve had salmon, seaweed, sushi, sticky rice dishes, mystery meats, fresh figs, all delicious, and all less than 200 yen. Below is an accounting of what the week has cost me. Transportation (buses, trains and subways) – 13,440 yen (about $140.00), Hostel accommodation for 4 nights (I took two overnight buses) – 6,000 yen (about $70.00), Food – 2,200 yen (about $25.00), Castles and Temples and bath – 1,500 yen (about $17.00), Sundries – 2,690 yen (about $28.00, mainly spent on a crochet hook and 10 balls of wool:)) . So the weeks total comes to about $280.00. Bearing in mind that I walked all the places I could, stayed in ten-bed dorm rooms, and I’m trying to lose a few pound so my food intake is on the low side. 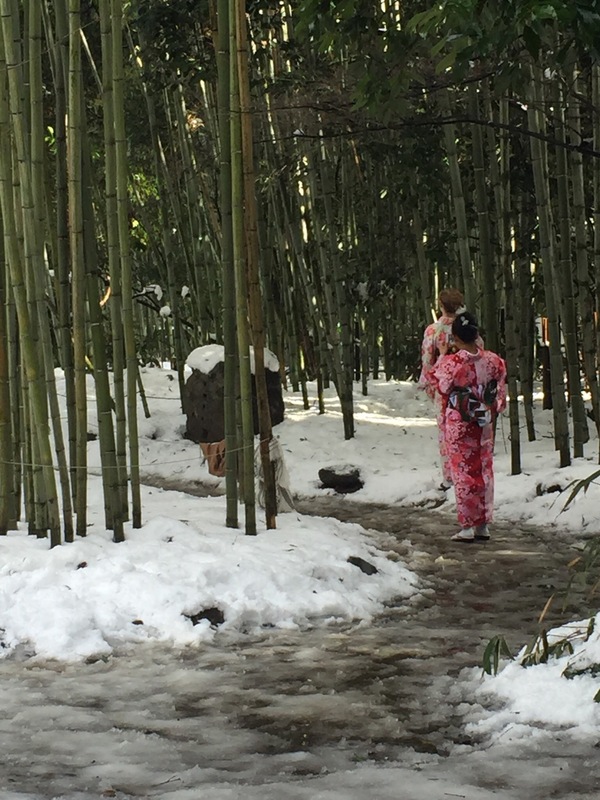 I know I’ve been more frugal than many people would want to be, but other than Kyoto’s record breaking snowfall, I’ve had a great time. But now I’m definitely ready for some warmth. Time to go, the plane is boarding. Next post from Thailand. Open countryside and exploring small villages are where my mind relaxes and I can breath easy. I usually avoid spending time in the crush of the city. It was my plan, while on the bus from Osaka to Kyoto, to look for somewhere rural where I could pitch my tent and do some hiking. But Osaka led into Kyoto with no rural in between. Taking into consideration the high cost of getting around, combined with the fact that it has been snowing here for the past few days, I’m not inclined to explore the tent option anymore. In my teens, I had a poster in my bedroom of a shrine backed by stunning countryside with Kyoto written at the bottom. It looked like the most tranquil place I could imagine and I dreamed of going there. 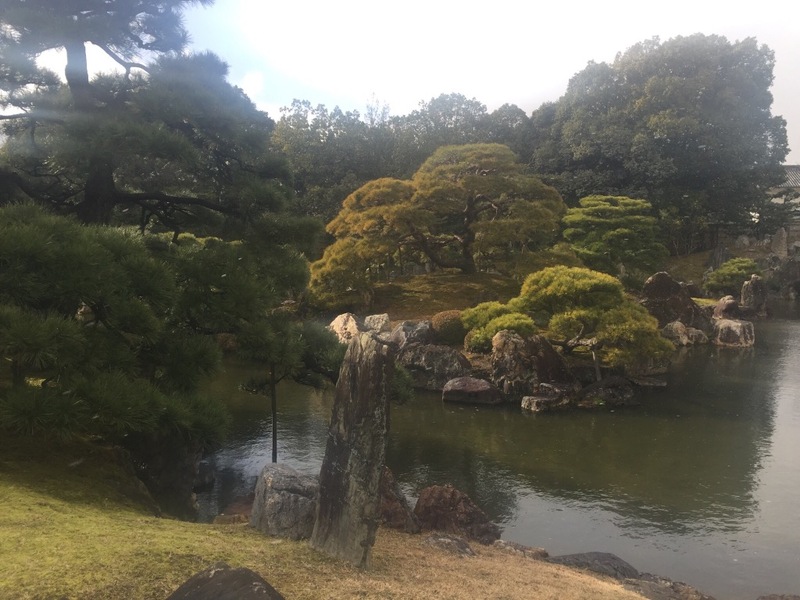 I am not in the rural Japan of my dreams but if I have to be in the city, Kyoto is the place. Nijo-jo Castle was built in 1603 as the official Kyoto residence of the Ist Tokugawa Shogun, Ieyasu. 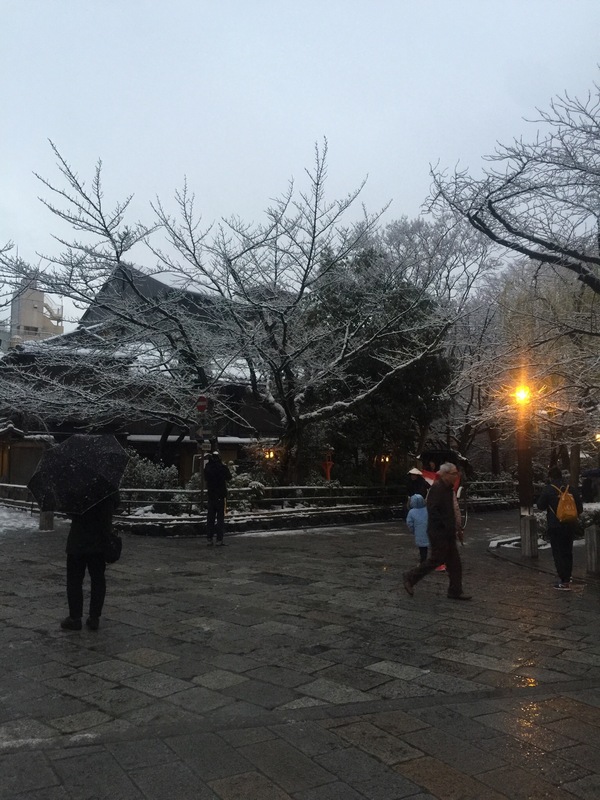 It is built in a simple but elegant architectural style called shoin-zakuri. 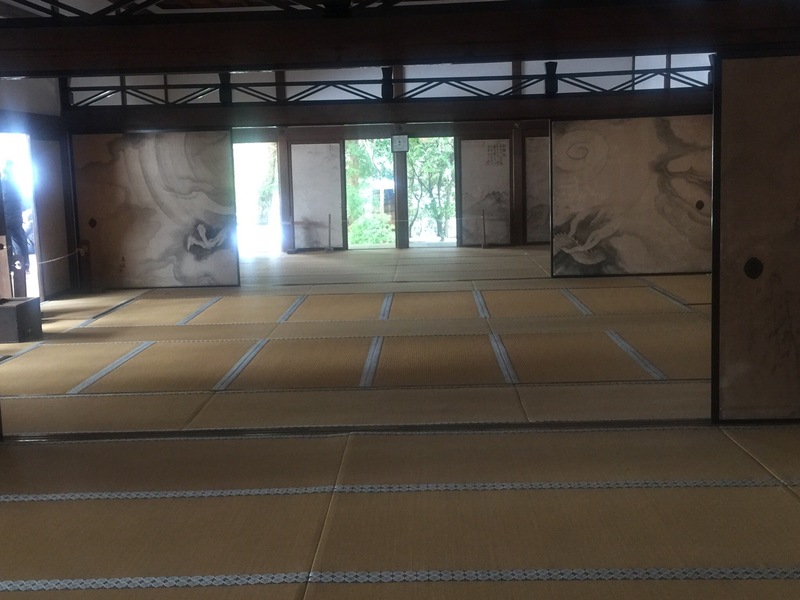 It has 33 empty rooms, over 800 tatami mats (the straw mats used in traditional Japanese rooms) and superb wall paintings. The lady at the hostel reception desk said I should also see Rokuon-ji Temple (The Golden Pavillon). The snow makes it especially beautiful, she said. Apparently it only snows here once every couple of years but I don’t believe it; it’s been snowing almost since I arrived. 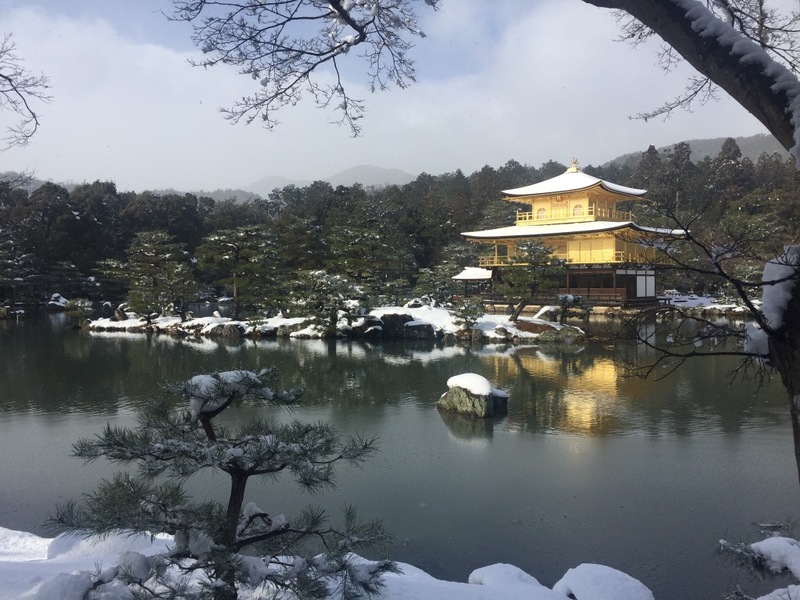 Kyoto’s 1,475,000 residents also wanted to see the snow-covered Golden Temple. Imagine a free Rolling Stones concert at Mooneys Bay – that’s how many people it seemed were there. But it was indeed beautiful. 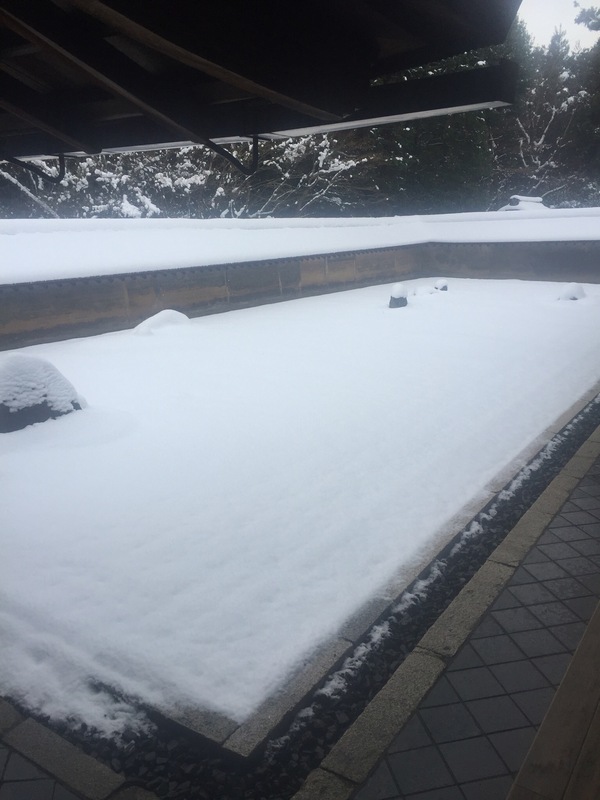 The famous Zen rock garden of Ryoanji Temple was also covered in snow when I saw it. It is a rectangular walled garden measuring 25 by 10 meters and was constructed in the Muromachi period around 1500. It has no trees and only 15 scattered rocks surrounded by white gravel. The walls are made of clay boiled in oil which has seeped out and made a beautiful Japanese style design. 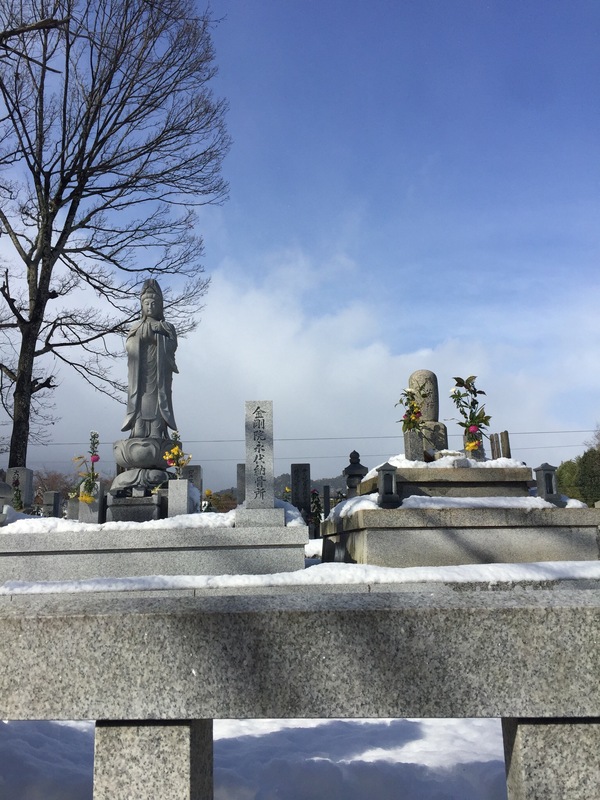 It was built by a highly respected Zen monk named Tokuho Zenketsu. The stone wash basin is inscribed “I learn only to be contented”. The concept is an important philosophy in the Zen spirit. Words to live by!